William Towns is most well known for his design work for Aston-Martin in creating the wedge shaped Aston-Martin Lagonda that in some respects looks like the sort of thing Giorgetto Giugiaro might have designed, it bearing some styling similarities to the Maserati Boomerang Giugiaro designed. William Towns in his work for Aston-Martin also created one of the most promising sports car designs ever created in Britain when he designed the Aston-Martin Bulldog. 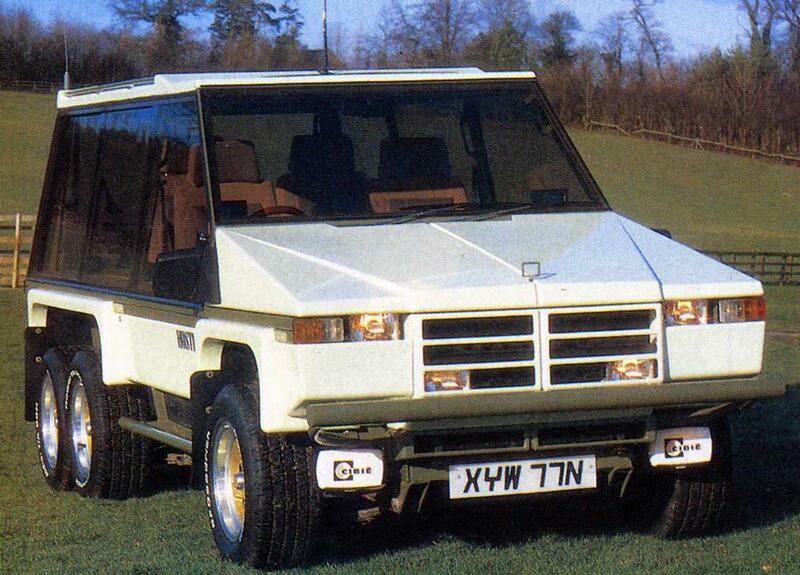 Sadly only one prototype of that 5.3 liter V8 mid-engine masterpiece was built. William Towns was interested in creating motor vehicles that were both works of art and completely utilitatarian. Cars that were owner centric not car manufacturer’s business model centric. Cars that people could build themselves, fix themselves and apply their creativity to. Its the common sense model for motor vehicle creation and William Towns was decades ahead of his time in his thinking. 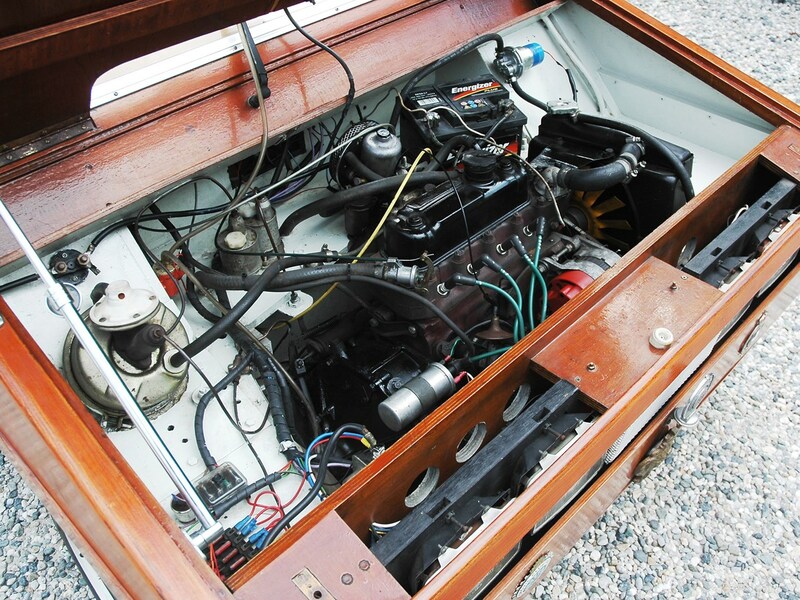 Yes, its an engine and transmission straight out of a Mini. The Mini’s front and rear sub-frames and suspension are used as well. To make his kit car affordable and achievable to build William Towns based it on the popular and ubiquitous BMC Mini. Beginning in 1978 William Towns used front and rear sub-frames from the common BMC Mini and built his utility art car around them. Between the front and rear sub-frames Towns created a steel frame and then his angular wedge like body to go on top. The body panels were usually fiberglass but could be made of other materials and the car in our pictures has been created using marine grade plywood. 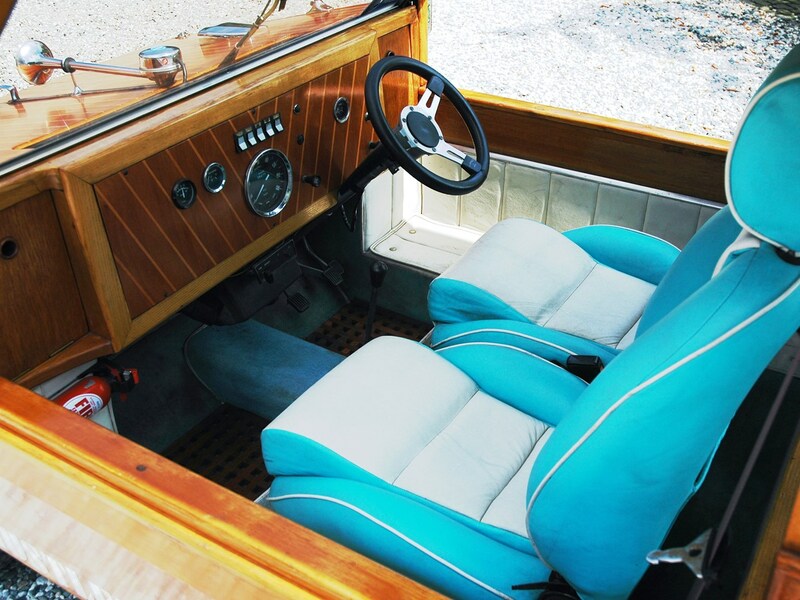 Marine plywood is a sensible choice for car construction remembering that Morgan have a long history of using a wood chassis and that up into the 1920’s the car industry was one of the heaviest users of commercial timber as the frames of most cars were made of wood. The wood dashboard is not just wood veneer. It’s solid wood. The Hustler comes in a variety of shapes and sizes either four wheeled or six wheeled. The car in our pictures is the six wheeled version which has two Mini rear sub-frames to create that. Seats are nicely shaped and look comfortable. Most Husters featured “Windoors” which means the windows and doors were the same thing and they were sliding. The wood Hustler in our pictures does not have Windoors so it is more like a Mini Moke. It does come with front seat belts and a fire extinguisher. Rear seating is much like that on the vehicles we ride around on in places like Thailand. 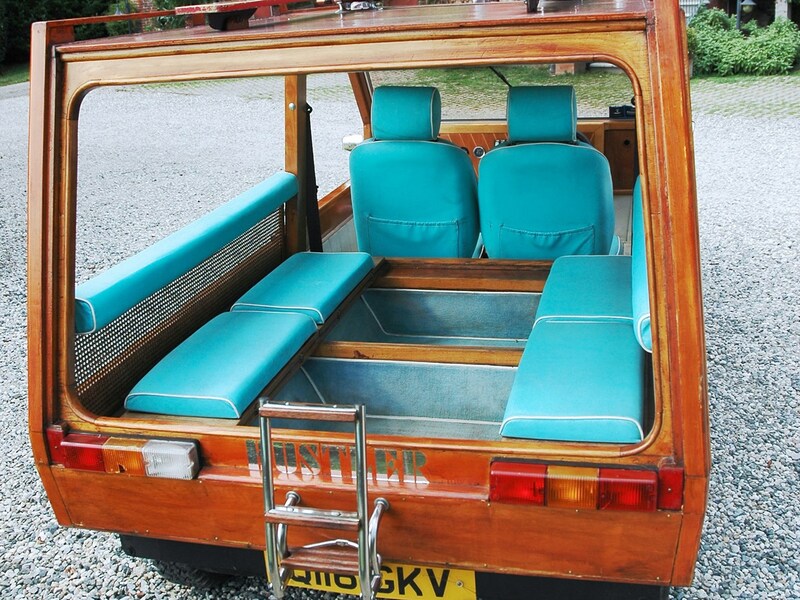 As only about 800 Husters were made it is rare to come across one for sale. The wood one made in marine style is coming up for sale by RM Sotheby’s at their London sale to be held on 7th September at Battersea Evolution in London, Britain. William Towns did not completely restrict himself to building his Huster cars on Mini sub-frames. He also used other sub-frames and engines. The Hustler Highlander for example was built using Jaguar XJ parts including the 5.3 liter V12 engine. The Hustler Highlander was built on a Jaguar XJ base and is powered by a 5.3 liter Jaguar V12 engine. (Picture courtesy banovsky.com). 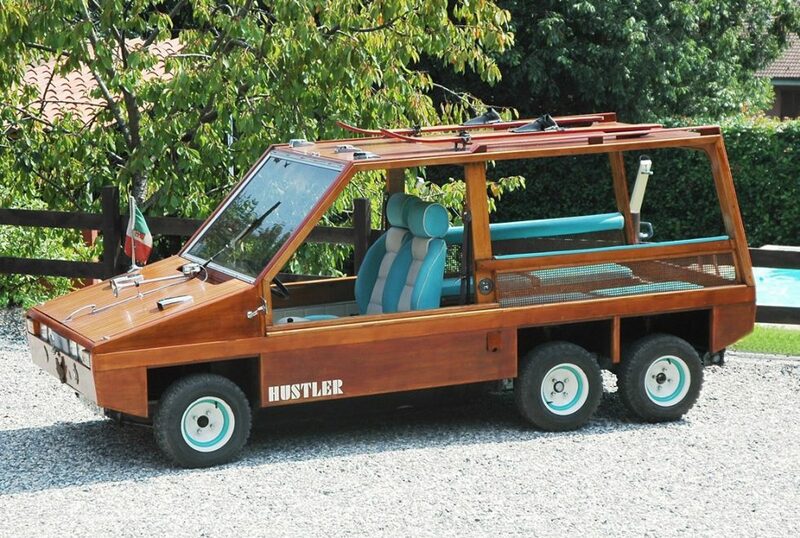 One of the most interesting of the Husters for Revivaler readers is the Hustler Huntsman which was created as a shooting brake hunting vehicle. These were based on BMC 1100/1300 or Austin Metro sub-frames and engine but made with good ground clearance. The Huster Huntsman is a very practical shooting brake. In this picture the sliding Windoors can be seen clearly. (Picture courtesy Marzal). British Leyland Mini-based original model. Used two Mini rear subframes to give four rear wheels. Larger and more powerful British Leyland 1100/1300 or Metro based model. 4 or 6 wheel versions. Stripped down Mini-based jeep version. Usually 4-wheeled but 6-wheel version available. Designed to be built from plans in marine ply with a supplied alloy-framed glasshouse. One-box MPV version. 4- or 6-wheel versions. Conventional, full-depth doors instead of sliding glass. 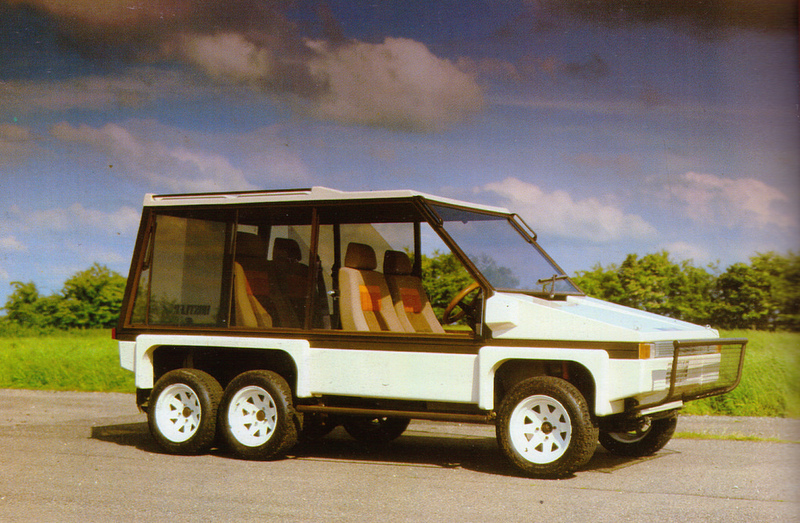 4- or 6-wheel versions. One-off imposing 6-wheeled Jaguar V12-powered luxury version. High-roof version designed to take a wheelchair in the back. Canvas roof version. 4 wheeled Mini sub frame. Similar to Hellcat. Only one ever produced. (Above list of models courtesy Wikipedia). And as if that were not a sufficiently comprehensive line-up there was also an eight wheeled amphibous Hustler based on the Crayford Argocat. Although William Towns may be best remembered for the Aston-Martin Lagonda and the Aston-Martin Bulldog it is perhaps the Hustler that qualifies as his best design concept. It was and still is visionary. The Hustler gives us a taste of what an “owner centric” motor vehicle could be like. The Hustler Hellcat (left) was the stripped down most basic Hustler. The amphibious eight wheeled Hustler (right) would make one of the most useful hunting, shooting and fishing wagons ever created.